Explore Hale Farm & Village and take an active part in history! Unique, immersive experiences bring campers into the cabins, kitchens, barns and farmyards, learning, working and playing alongside new friends. Each single-day experience (10am to 4 pm) includes a snack and materials; please provide a sack lunch. What was life like as a Civil War Soldier? 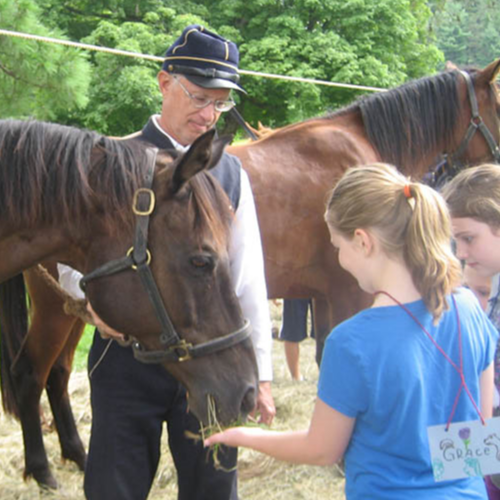 Meet the Sixth Ohio Volunteer Cavalry, and their horses, too! Train and drill with the soldiers, and experience camp life as we prepare for our annual Civil War Reenactment.